This recipe was one that I sort of threw together on a whim. I was in the mood for fajitas, but didn’t have enough shells. I also have an abundant supply of quinoa in my pantry. Since I’m a huge fan of one-bowl dinners, I figured that this one would be a winner. If you’ve never cooked with quinoa before, don’t panic! It has a similar cooking time& style to rice. I make it in my rice cooker, using a similar ratio of water to grain (2:1). It also reheats very, very well – much better than rice. The only catch is that you need to rinse it before boiling, or else it will have a bitter taste to it. The leftovers are good on their own, as well as in a stray tortilla shell. 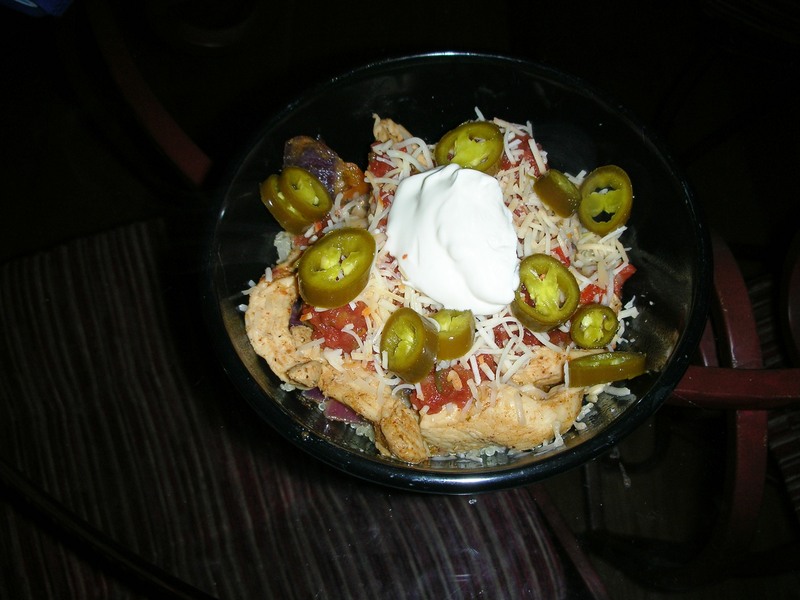 taco seasoning – I used Penzey’s Arizona Dreaming blend. You can also use your own favorite taco/fajita seasoning. 2 cups quinoa, cooked – make sure you start cooking the quinoa about 15 minutes before you start the chicken! Heat oil in pan. Add pepper & onion. Once they are tender, add garlic and chicken. Cook until chicken is no longer pink, adding spices to the pan as time goes on. Once chicken is cooked, remove from heat. In a bowl, layer as follows: Quinoa, fajita mixture, taco fixin’s. Beef or pork can easily be used instead of chicken. Truthfully, you could even eat this sans meat, as quinoa is chock-full of protein. And, as I said before…oh-so-EASY! MMM! Quinoa is something we have a love-hate relationship with in our house…. I try to make it in different dishes but my husband chokes through it like he’s eating gritty kitty litter. I did find this recipe he LOVES so much he rolls in it, you should try it! It’s the only way he will eat quinoa now! Ooh, that sounds good for breakfast!